Cosmic rays are not really rays at all, they are high energy charged particles, originating in outer space, that travel at nearly the speed of light and strike the Earth from all directions. They are produced by a number of different sources, such as the Sun, other stars, and more exotic objects, such as supernova and their remnants, neutron stars and black holes, as well as active galactic nuclei and radio galaxies. Most cosmic rays are the nuclei of atoms, ranging from the lightest to the heaviest elements in the periodic table. 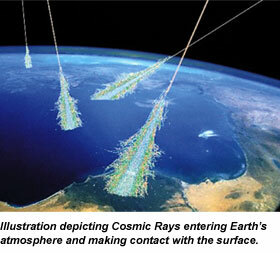 Cosmic rays also include high energy electrons, positrons, and other subatomic particles. The term 'cosmic rays' usually refers to galactic cosmic rays, which originate in sources outside the solar system, distributed throughout our Milky Way galaxy. However, this term has also come to include other classes of energetic particles in space, including nuclei and electrons accelerated in association with energetic events on the Sun (called solar energetic particles), and particles accelerated in interplanetary space. Cosmic rays include essentially all of the elements in the periodic table; almost 90% of the cosmic rays which strike the Earth's atmosphere are protons (hydrogen nuclei) and about 9% are alpha particles. Electrons amount to about 1%. There is a small fraction of heavier particles which yield some interesting information. About 0.25% are light elements (lithium, beryllium and boron), but this is greatly enriched over the abundance of these elements in the universe which is only about one billionth! From this evidence it is implied that these light elements come from the bombardment of heavier particles.